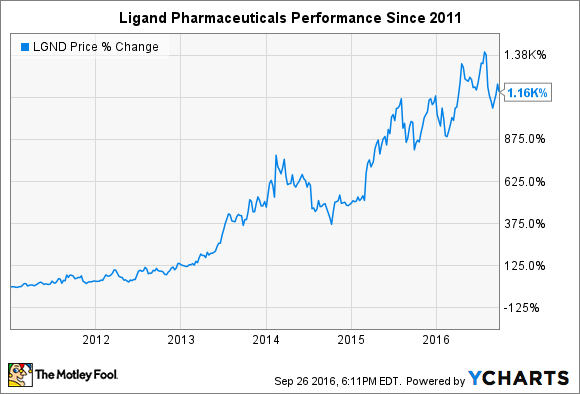 Ligand Pharmaceuticals has returned over 1,160% since the beginning of 2011. If you'd invested in Ligand Pharmaceuticals (NASDAQ:LGND) on the first trading day of 2011, then you would have lucked into an 11-bagger. Not bad. While I'm cherry-picking the data to make a point, that doesn't change the fact that the company is uniquely positioned to continue returning above-average returns to investors. With a market valuation of just $2.3 billion and a low-cost business model focused on cost-free royalties, Ligand Pharmaceuticals will only get better with time. Rather than go through the expensive and risky process of discovering and developing drug candidates from animal studies through phase 3 trials, Ligand Pharmaceuticals only takes on some of the risks associated with the drug development process. It takes certain clinical candidates to phase 1 or even phase 2 trials, but then it hands them off to pharma and biopharma heavyweights in return for up-front milestone payments and the potential to collect royalties on future product sales. This business model allows the company to have a tremendous number of chances at success, or "shots on goal," as CEO John Higgins likes to say. At the end of the second quarter of 2016, Ligand Pharmaceuticals had over 150 fully funded programs partnered or licensed with other companies. Even if 90% of those drug candidates fail to gain regulatory approval, the company would still be collecting royalties from 15 marketed products -- and that doesn't include up-front and milestone payments received along the way. Last year, the millionaire-maker stock generated $71.9 million in total revenue, representing growth of 11% from 2014 and 129% growth from 2012. The unique business structure has already generated revenue of $49.2 million in the first half of this year -- and full-year guidance is setting expectations for between $115 million and $119 million in total sales. Novartis' Promacta, which has notched year-to-date sales of $289 million. Amgen's Kyprolis, which has achieved global year-to-date sales of $326 million, representing year-over-year growth of 44%. Both Promacta and Kyprolis are expected to earn blockbuster status -- i.e., peak sales greater than $1 billion annually. Meanwhile, Spectrum Pharmaceuticals' Evomela just hit the market this summer. While sales data isn't available, it's one of the highest royalty-bearing products in Ligand Pharmaceuticals' portfolio at 20% of sales. Evomela may only hit $200 million in peak sales, but that would still contribute up to $40 million per year to Ligand Pharmaceuticals' top line. In addition to the individual drugs I've mentioned, the company is supported by four distinct technology platforms spanning small-molecule development and human-antibody discovery and generation. Each represents licensing and royalty generation opportunities of interest to partners within specific fields. Image source: Ligand Pharmaceuticals investor presentation. The combination of acquisitions for single promising drug candidates and drug discovery and manufacturing platforms underpins this millionaire-maker stock's impressive run. In 2011, the underlying annual product revenue from marketed drugs paying royalties to Ligand Pharmaceuticals stood at less than $250 million. This year, that number is expected to climb to $1.75 billion -- and to more than $2.25 billion in 2017. That hints that the impressive growth investors have enjoyed in recent years is far from over. In a sense, Ligand Pharmaceuticals offers the best of biopharma investing: It has the potential for rapid growth without the risk of devastating binary outcomes. The company's impressive portfolio of licensed products -- and its stable of big-name partners -- should easily allow the company to continue growing from its relatively low revenue. While I can't say whether the stock will churn out more millionaires from this price point, it doesn't seem that the growth is in jeopardy of ending anytime soon.